Little Witches | The Kids Beat | Kids VT - small people, big ideas! Books: "There's a Witch in My Sock Drawer"
A tiny witch cleverly solves two thorny parenting puzzles in a new book by Thea Lewis: What happens to un-matched socks in the laundry? How do you motivate kids to clean their rooms? Although she is still a witch-in-training, Zula reveals to the main character Lucy that she's been "spiriting" away socks for practice. A coven of small spell-casters is responsible for tidying the room. This is a relief for Lucy, who received a mom-issued ultimatum: Clean up, or no trick-or-treating. There's a Witch in My Sock Drawer is the first children's book for Lewis, who created the Queen City Ghostwalk and authored Haunted Burlington: Spirits of Vermont's Queen City. 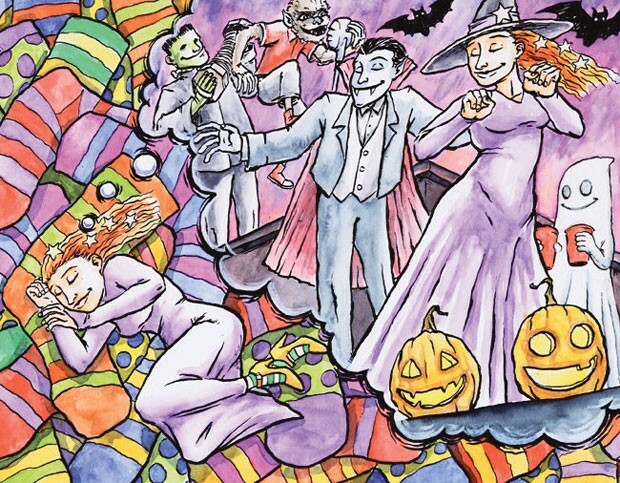 Lewis teams up with Burlington artist Ian Webb in the fresh-off-the press, Halloween-themed book aimed at middle schoolers. Want to hear more? Lewis reads aloud in the University Mall atrium from 3 to 3:30 p.m. on Sunday, October 30. There's a Witch in My Sock Drawer: By Thea Lewis, Peapod Press, $10.95. Available in several local bookstores, including Phoenix Books and Café in Essex and UVM's Catamount Store on Church Street. Info, thealewis.com.